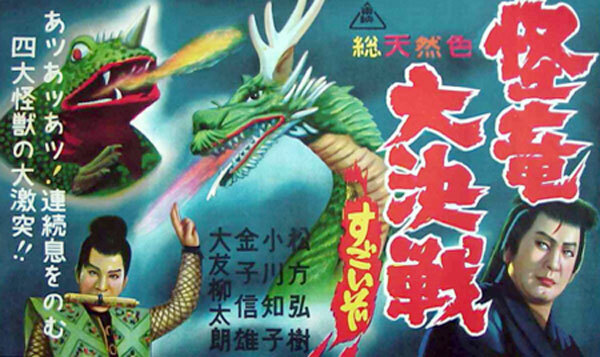 In this episode, the crew (not pictured) dive into the Magic Serpent (pictured) by Toei! This episode takes a look at a film that barely qualifies as a kaiju movie. 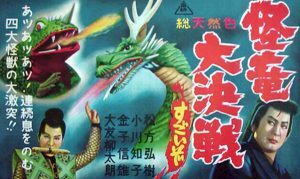 The Magic Serpent (1966) is a Japanese fantasy film version of a classic tale Jiraiya Gouketsu Monogatari. And while the monster appearances are few and far between, depending on what version you watch, you could be hearing some familiar roars to the kaiju aficionado. The film itself went over pretty well with our crew for this episode – we hope you enjoy the episode, as short as it ended up being. For our December discussion, we’ll be turning our attention once again to Korea – this time, we’re watching Dragon Wars (2007). If you’d like to submit your “homework” for the episode, please do so before December, 22nd.